Globalplacement.com was founded in 2003 as an online mediation agency for international internships, graduation assignments and traineeships. The Dutch success formula of Stageplaza.nl (Dutch market leader in online mediation for students) founded Globalplacement.com. The web site is the answer to the high demand for foreign internships, increasing mobility among students worldwide and quickly reducing international trade barriers. Both students and companies have an increasing international focus. 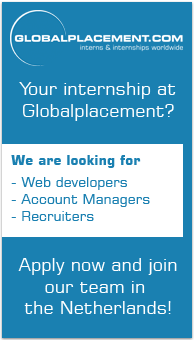 Globalplacement.com seeks to bring students and companies together with an internet-based communication network that matches students and companies better and faster than ever before. In close cooperation with a global network of franchise partners, our website has grown and is still growing very quickly (more than 5000 student subscriptions a month). Besides a global network Globalplacement.com has been supported by the European Union initiative Leonardo da Vinci. We share a vision: to increase mobility, to stimulate innovation and to improve training quality. Our dedicated team is consists of 45 employees. We consequently live up to our mission: to serve as a national and international authority in online internship mediation.